Working from jamespetts's committed files, I revised the .dat to include four rotations. Furthermore the selection of mills tiles varies over time to show the growth from a 1750 low-efficiency twin hearth, to 1790 with a single hearth with larger workshop, to 1850 with a second storey on the workshop and workings buildings. The mills1, mills2 images are slightly updated as well. Zipfile here includes playable .pak for the impatient among us. The Photo loks super out. Looks good - may I ask what the deal is with the tile that appears blank in the two images currently? 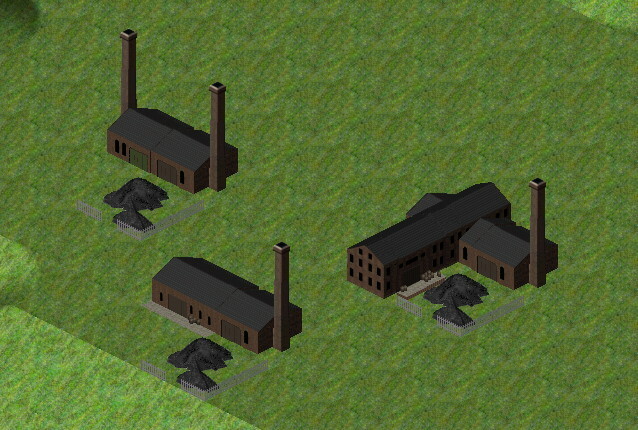 Might be best to fill the gap with a generic yard tile or a dump of coal/ore? Or some boxes of goods waiting for shipment away? The latest Standard builds allow for non-rectangular industries. Perhaps it is related to that? Since when? I thought all industries had to have the four corners defined even if they had holes in the middle. since some time. Iirc this is included in the 112 release already. So L-shape is now allowed? Adding to the .dat should be fairly simple, I hope... or I can do it, just say the word. Great! Any reason why some appear not to have snow? If you are able to do the dat in the next 12 hours it will make it into the next release. Try this zipfile (.dat and Gimp .xcf sources included). p.s., Finished snow on one or two other buildings -- the others without snow, are currently unused. Brilliant thanks. 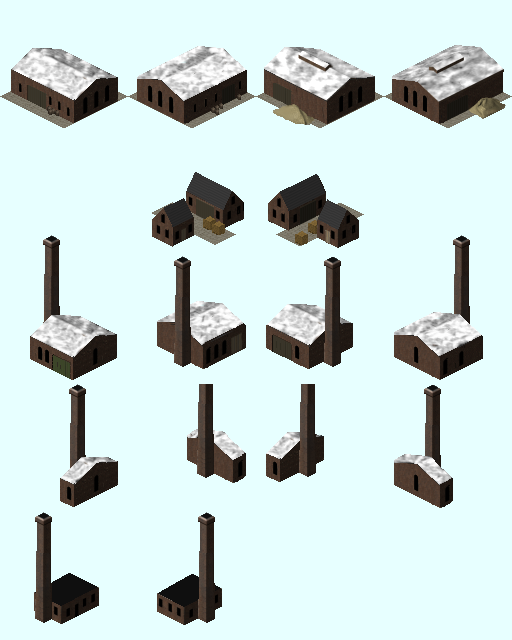 Did you see my post in the other thread about a dat for the pharmaceutical factory? If you get time over Christmas, it would be great if you could code up other factory graphics for the other chains. Feel free to experiment with "fields" as well - just bear in mind these don't get rotations. Just adding this to SVN. I also decided to create a new goods type "wrought iron" which is produced by the ironworks and required by the builders' yard up to 1855. From then on Builders' yards now also accept steel. Is this in addition to or as well as "hardware"? cool that the ironwork now in svn it. Hmm - looking at this commit, the changes to goods-128.dat seem to be missing. Would wrought iron be defined as piece goods? It would, I suppose, be finished pieces of wrought iron, rather than pig or bar iron, which would rather be bulk or long goods? 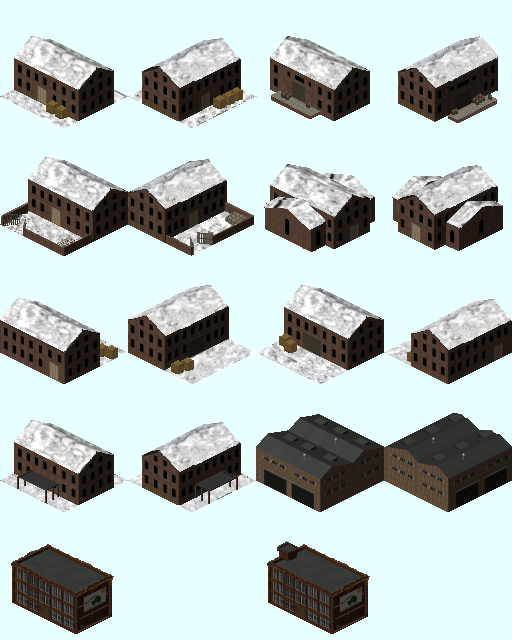 Also, I notice that you have added "chance" variables to a number of buildings - these are not used by industries in Simutrans. "Distributionweight" is used instead. Distributionweight it that what said how often a factory on a map comes. Looks like I missed that - which also explains why I can't get the SVN build to work (just I'm getting a different error message than what I expected for that problem). It's going in now. Lovely - that is helpful. However, iron ore doesn't have its own load graphics for the various wagons. Is this intended? Only steel and wood are defined as long goods (category 6). Do we need to produce new graphics for all the long goods wagons (including narrow gauge and road vehicles)? I suspect that the wood images will be used in at least some cases, as wood is defined as the 0th graphic in, for example, the 10t long wagon. OK, I checked a few and steel was the 0th graphic so that would get used; I'm fine with that. But we will need to ensure all long graphics have steel as the 0 graphic rather than wood. I don't think we need an additional graphic for wrought iron. Hmm - isn't wrought iron significantly darker than steel...? A similar situation prevails in wagon-long-10t.dat, wagon-ng-long-sar.dat, wagon-long-30t.dat, wagon-long-20t.dat, wagon-long-12t.dat, wagon-ng-bogie-long.dat and wagon-ng-long.dat. The canal barges and road vehicles seem to have steel as the 0th good. I still suspect that it would be better to have separate images for wrought iron. I had wondered whether it would be possible to produce new graphics quickly using the Gimp, but it seems that it is insufficiently easy to distinguish between the load pixels and the wagon pixels in an automated way to make this work.